The Palestinian Prisoners’ Society (PPS) has reported that Israeli soldiers abducted, overnight until morning hours Thursday, twenty-one Palestinians from their homes, in several parts of the occupied West Bank. The soldiers invaded and violently searched dozens of homes across the occupied West Bank, including East Jerusalem, and interrogated many Palestinians while inspecting their ID cards. The PPS office in Bethlehem has reported that the soldiers abducted seven Palestinians from the governorate, and identified them as Ali Ismael Battat, Jawad Mohammad Taqatqa, Ahmad Shaker Taqatqa, Raed Mohammad Taqatqa, Ahmad Yousef Sa’doun, Suleiman Mofeed Salah and Ahmad Yousef Da’dou. In Nablus, in northern West Bank, the soldiers abducted Othman Hamed ‘Oweis, Bara’ Mohannad ‘Oweiss, Mahmoud Abdul-Nasser Nubani, Mahmoud Marwan Daraghma, and Mahdi Abdul-Karim Daraghma. In Jenin, also in northern West Bank, the soldiers abducted Ahmad Jamal Qombo’, Osama al-Bashar and Ahmad Ata al-Jabali. In Hebron, in southern West Bank, the soldiers abducted Abdul-Mahdi Mahmoud Zeidat. In Ramallah, in central West Bank, the soldiers searched several homes and abducted Adnan Khamis Suleiman, while Montaser Salama was abducted from his home in Jericho. 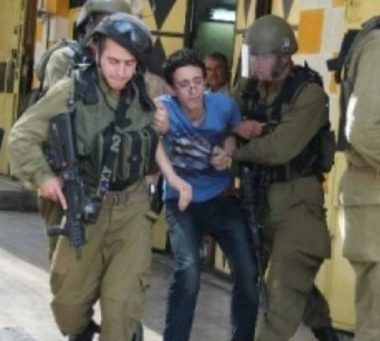 In addition, the soldiers invaded homes and Qalandia refugee camp, north of Jerusalem, and abducted a child, identified as Ahmad Nasser Adawi, 15. On Wednesday at night, the soldiers abducted two young men, identified as Emad Abu Sneina and Mohammad Shaweesh, while leaving the Al-Aqsa Mosque in Jerusalem. In related news, dozens of illegal colonialist settlers and officers invaded, Thursday, the courtyards of the Al-Aqsa Mosque in Jerusalem and conducted provocative tours after preventing the Palestinians from entering the holy site’s compound. Furthermore, several colonialist settlers invaded the villages of al-Janiya and Ras Karkar, west of the central West Bank city of Ramallah, punctured tires of several cars and wrote racist graffiti.